When should you start to think about bone health? The answer to that is right now if you haven’t already. Osteoporosis affects 8 million American women and one of every two women will have an osteoporosis-related fracture in her lifetime. My mom has osteoporosis so I know it is something that I need to be very concerned about and to take preventative measures now before its too late. It’s never too early to start thinking about bone health. Vitamin D is also important for maintaining healthy bones and most of us aren’t getting enough especially now in winter when there is limited sunlight time. Heart health is another issue that us gals need to remember. More than 50 million women have blood cholesterol levels high enough to pose a risk for heart disease. As if we didn’t have enough to worry about already! According to the American Heart Association, there is evidence that high blood cholesterol is not only associated with plaque formation on the arteries, but also to osteoporosis! 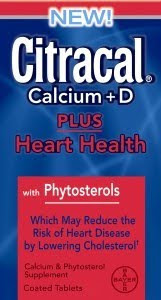 Citracal Calcium Plus Heart Health aims to address these important health concerns. It contains 1,260 mg of calcium per daily dose plus Vitamin D to support calcium absorption. It has more calcium than any of the other leading brands. In addition, it has Phytosterols, a natural plant ingredient that may reduce the risk of heart disease by lowering cholesterol. It is the only calcium supplement that helps you care for both your bones and your heart daily. They recommend you take 2 tablets twice a day with food and you can buy it at food, mass and drug stores nationwide. It costs $13.99 for an 80 count bottle.